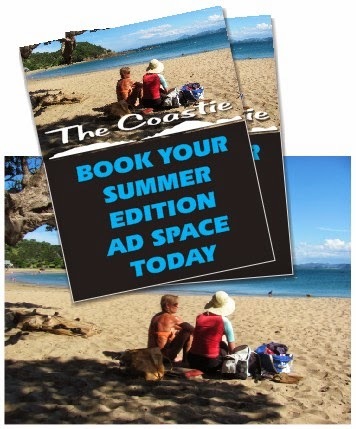 The Coastie - Tutukaka Coast Magazine: SUMMER EDITION 2014/15 - Now open for advert bookings! SUMMER EDITION 2014/15 - Now open for advert bookings! Whether your business is based on the Tutukaka Coast, in Whangarei or beyond, The Coastie SE offers great exposure during the summer holidays from mid December to February. Publication: the 40-page Summer Edition has a print run of 4500 copies in full colour, A5 format. Published and distributed mid December 2014 until February 2015. Reach: we distribute FREE to 1150 local households by postal delivery, stock local business venues and shops, art galleries, car mechanic, takeaways, cafes, restaurants, holiday park, B&Bs, resort accommodation providers, visitor information centers in Whangarei (i-sites) and several key venues in the city to help bridge the City and the Coast. We’re looking forward to you joining us this summer.